It was the tallest building in the world for 238 years (1311–1548), and the first building to hold that title after the Great Pyramid of Giza. The central spire collapsed in 1548 and was not rebuilt. For hundreds of years the cathedral held one of the four remaining copies of the original Magna Carta, now securely displayed in Lincoln Castle. The cathedral is the fourth largest in the UK (in floor area) at around 5,000 square metres (54,000 sq ft), after Liverpool, St Paul's and York Minster. It is highly regarded by architectural scholars; the Victorian writer John Ruskin declared: "I have always held ... that the cathedral of Lincoln is out and out the most precious piece of architecture in the British Isles and roughly speaking worth any two other cathedrals we have." Remigius de Fécamp, the first Bishop of Lincoln, moved the episcopal seat (cathedra) there "some time between 1072 and 1092" About this, James Essex writes that "Remigius ... laid the foundations of his Cathedral in 1072" and "it is probable that he, being a Norman, employed Norman masons to superintend the building ... though he could not complete the whole before his death." Before that, writes B. Winkles, "It is well known that Remigius appropriated the parish church of St Mary Magdalene in Lincoln, although it is not known what use he made of it." Remigius built the first Lincoln Cathedral on the present site, finishing it in 1092 and then dying on 7 May of that year, two days before it was consecrated. In 1124, the timber roofing was destroyed in a fire. Alexander (bishop, 1123–48) rebuilt and expanded the cathedral, but it was mostly destroyed by an earthquake about forty years later, in 1185 (dated by the British Geological Survey as occurring 15 April 1185). The earthquake was one of the largest felt in the UK: it has an estimated magnitude of over 5. The damage to the cathedral is thought to have been very extensive: the Cathedral is described as having "split from top to bottom"; in the current building, only the lower part of the west end and its two attached towers remain of the pre-earthquake cathedral. Some (Kidson, 1986; Woo, 1991) have suggested that the damage to Lincoln Cathedral was probably exaggerated by poor construction or design; with the actual collapse most probably caused by a vault failure. "For north represents the devil, and south the Holy Spirit and it is in these directions that the two eyes look. The bishop faces the south in order to invite in and the dean the north in order to shun; the one takes care to be saved, the other takes care not to perish. With these Eyes the cathedral's face is on watch for the candelabra of Heaven and the darkness of Lethe (oblivion)." Between 1307 and 1311 the central tower was raised to its present height of 271 feet (83 m). The western towers and front of the cathedral were also improved and heightened. At this time, a tall lead-encased wooden spire topped the central tower but was blown down in a storm in 1548. With its spire, the tower reputedly reached a height of 525 feet (160 m) (which would have made it the world's tallest structure, surpassing the Great Pyramid of Giza, which held the record for almost 4,000 years). Although there is dissent, this height is agreed by most sources. Other additions to the cathedral at this time included its elaborate carved screen and the 14th-century misericords, as was the Angel Choir. For a large part of the length of the cathedral, the walls have arches in relief with a second layer in front to give the illusion of a passageway along the wall. However the illusion does not work, as the stonemason, copying techniques from France, did not make the arches the correct length needed for the illusion to be effective. The Lincoln Magna Carta was on display at the British Pavilion during the 1939 New York World's Fair. In March 1941, the Foreign Office proposed that the Lincoln Magna Carta be gifted to the United States, citing the "many thousands of Americans who waited in long queues to view it" and the US passage of the Lend-Lease Act, among other reasons. In 2009 the Lincoln Magna Carta was lent to the Ronald Reagan Presidential Library in Simi Valley, California. There are three other surviving copies; two at the British Library and one at Salisbury Cathedral. One of the stone carvings within the cathedral is the Lincoln Imp. There are several variations of the legend surrounding the figure. According to 14th-century legend, two mischievous imps were sent by Satan to do evil work on Earth. After causing mayhem elsewhere in Northern England the two imps headed to Lincoln Cathedral, where they smashed tables and chairs and tripped up the Bishop. An angel appeared in the Angel Choir and ordered them to stop. One of the imps sat atop a stone pillar and started throwing rocks at the angel whilst the other cowered under the broken tables and chairs. The angel turned the first imp to stone, allowing the second imp to escape. The imp that turned to stone can still be found sitting atop his stone column in the Angel Choir. They also are one of the many carved animals on the structure. The Wren Library houses a rare collection of over 277 manuscripts, including the text of the Venerable Bede. 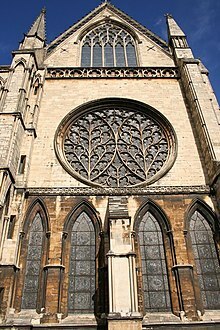 Lincoln Cathedral features two major rose windows, which are a highly uncommon feature among medieval architecture in England. On the north side of the cathedral there is the “Dean's Eye” which survives from the original structure of the building and on the south side there is the “Bishop's Eye” which was most likely rebuilt circa 1325–1350. This south window is one of the largest examples of curvilinear tracery seen in medieval architecture. Curvilinear tracery is a form of tracery where the patterns are continuous curves. This form was often done within pointed arches and squared windows because those are the easiest shapes, so the circular space of the window was a unique challenge to the designers. A solution was created that called for the circle to be divided down into smaller shapes that would make it simpler to design and create. Curves were drawn within the window which created four distinct areas of the circle. This made the spaces within the circle where the tracery would go much smaller, and easier to work with. This window is also interesting and unique in that the focus of the tracery was shifted away from the centre of the circle and instead placed in other sections. The glazing of the window was equally as difficult as the tracery for many of the same reason; therefore, the designers made a decision to cut back on the amount of iconography within the window. Most cathedral windows during this time displayed many colourful images of the bible; however at Lincoln there are very few images. Some of those images that can be seen within the window include saints Paul, Andrew, and James. Wooden trusses offer a solid and reliable source of support for building because, through their joints, they are able to resist damage and remain strong. Triangles are the strongest shape because, no matter where the force is being placed on them, they are able to use their three joints to their fullest extent to withstand it. Making trusses with triangles inside larger triangles adds even more strength, as seen in Lincoln's choir. The design of all wooden trusses is a tedious task as there are many different things that need to be considered while building these supports. There are many different ways that the trusses can fail, if they are not designed or built properly; it is therefore crucial to design trusses that suit a specific building with specific needs in mind. The simplest form of a truss is an A-frame; however, the great amount of outward thrust generated by this often causes the truss to fail. The addition of a tie beam creates a triangular shape, although this beam can sometimes sag if the overall truss is too large. Neither one of these types would have been suitable for Lincoln, owing to the sheer size of the roof. They would have failed to support the building, so collar beams and queen posts were added to help prevent sagging. To protect against wind damage, braces were added. Secondary rafters were also added to the design to ensure that the weight was equally distributed. Saint Hugh's Choir has a total of thirty six trusses keeping the roof in place, and it is held up entirely by means of its own weight and forces. One major architectural feature of Lincoln Cathedral are the spectacular vaults. The varying vaults within the cathedral are said to be both original and experimental. The vaults especially, clearly define the experimental aspect seen at Lincoln. There are several different kinds of vaults that differ between the nave, aisles, choir, and chapels of the cathedral. Along the North Aisle there is a continuous ridge rib with a regular arcade that ignores the bays. Meanwhile, on the South Aisle there is a discontinuous ridge rib that puts an emphasis on each separate bay. The North West Chapel has quadripartite vaults and the South Chapel has vaults that stem from one central support columns. The use of sexpartite vaults allowed for more natural light to enter the cathedral through the clerestory windows, which were placed inside of each separate bay. A clock by John Thwaite was installed in the north west tower in 1775. This was later improved by Benjamin Vulliamy and moved to the broad tower around 1835. It was replaced in 1880 by a new clock under the instruction of Edmund Beckett QC. The clock was built by Potts and Sons of Leeds. Cambridge Chimes were a feature of the new clock. The clock featured a double three-legged gravity escapement to the designs of Edmund Beckett. The machinery weighs about 4 long tons (4.5 short tons), with the driving weights being 1.5 long tons (1.7 short tons), suspended by steel-wire ropes 270 feet (82 m) long, and the pendulum weight of 2 long hundredweight (100 kg). The beat is 1.5 seconds. The hour hammer is 224 pounds (102 kg), striking upon Great Tom. The striking trains require winding daily, when done manually it took 20 minutes. The going train required winding twice per week. The clock mechanism contains the inscription Quod bene vortat Deus Opt. Max., Consiliis Edmundi Beckett, Baronetti, LL.D., Opera Gul. Potts et Filiorum, civium Leodiensium, Sumptibus Decani et Capituli, Novum in Turri positum est Horologium, A.D. MDCCCLXXX. Lincolnshire was home to many Bomber Command airfields during the Second World War, giving rise to the nickname of 'Bomber County'. The station badge for the nearby RAF Waddington depicts Lincoln Cathedral rising through the clouds. Until the opening of the RAF Bomber Command Memorial in 2012, the cathedral had the only memorial in the United Kingdom dedicated to Bomber Command's large losses of aircrew in the Second World War. During the war, 'priceless British treasures' were placed in a chamber sixty feet beneath the cathedral for safekeeping. This did not include the cathedral's copy of the Magna Carta as it was on loan in the United States. A gilded crown recently installed on one of the towers. Stonework commemorating the end of fox hunting – a fox can be seen hiding in the foliage. According to the October 2016 edition of Cathedral Times from Lincoln Cathedral, £1.6 million a year is spent keeping the cathedral in shape; the most recent project completed has been the restoration of the West Front in 2000. About ten years ago[when?] it was discovered that the flying buttresses on the east end were no longer connected to the adjoining stonework, and repairs were made to prevent collapse. The most recent problem was the discovery that the stonework of the Dean's Eye window in the transept was crumbling, meaning that a complete reconstruction of the window has had to be carried out according to the conservation criteria set out by the International Council on Monuments and Sites. There was a period of great anxiety when it emerged that the stonework needed to shift only 5 mm (0.20 in) for the entire window to collapse. Specialist engineers removed the window's tracery before installing a strengthened, more stable replacement. In addition to this the original stained glass was cleaned and set behind a new clear isothermal glass which offers better protection from the elements. By April 2006 the renovation project was completed at a cost of £2 million. Recently, concerns have been growing once more about the state of the West Front, as there has been some stonework falling, which has raised questions as to the effectiveness of the repairs carried out in 2000. Between 2006 and 2009, 200,000 to 208,000 people visited Lincoln Cathedral annually. In 2010 the figure dropped to 150,000, making it the 16th-most visited attraction in the East Midlands. The fall in visitor numbers was attributed to the cancellation of the Lincoln Christmas Market that year. The admission fee is £8.00, with concessions. The Cathedral website states; "Everyone is free to enter and gaze at the glory of the nave; you can sit in the peace of the Morning Chapel or visit the shop. If you want to explore further, we do ask you to pay." The cathedral offers tours of the cathedral, the tower and the roof. The peak of its season is the Lincoln Christmas Market, accompanied by a massive annual production of Handel's Messiah. The cathedral was used for the filming of The Da Vinci Code (based on the book of the same name). Filming took place mainly within the cloisters, and chapter house, of the cathedral, and remained a closed set. The Cathedral took on the role of Westminster Abbey, as the Abbey had refused to permit filming. Although there was protest at the filming, the filming was completed by the end of August 2005. To make the Lincoln chapter house appear similar to the Westminster Chapter House, murals were painted on a special layer over the existing wall, and elsewhere polystyrene replicas of Isaac Newton's tomb and other Abbey monuments were set up. For a time these murals and replicas remained in the Chapter House, as part of a Da Vinci Code exhibit for visitors, but in January 2008 they were all sold off in an auction to raise money for the Cathedral. The cathedral also doubled as Westminster Abbey for the film Young Victoria, filmed in September 2007, and did again in June 2018 for the upcoming Netflix Shakespeare film The King. The choir is currently formed of adult singers (who are either lay vicars, choral scholars or junior choral scholars), and teams of about 20 girls and 20 boys. The cathedral accepted female choristers in 1995. Lincoln was only the second cathedral in the country to adopt a separate girls' choir (after Salisbury Cathedral) and remains one of few who provide exactly the same musical opportunities and equal weekly singing duties to both girls and boys. The choristers can now attend any school and are currently drawn from 10 local schools. The installation of a new organ was made possible in 1898, after a donation by a Lincoln industrialist, Alfred Shuttleworth, of £1,000 towards the total cost of £4,675 (equivalent to £510,000 in 2018). The remainder was met by several other individual donations and public subscription. The organ is one of only two Willis organs in English cathedrals which retain their original tonal scheme. 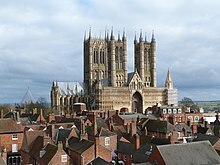 The records of cathedral organists at Lincoln are continuous from 1439 when John Ingleton was the incumbent. Notable organists have included the Renaissance composers William Byrd and John Reading and the biographer of Mendelssohn, William Thomas Freemantle. Since 2003 the post of Organist Laureate has been held by Colin Walsh and that of Director of Music has been held by Aric Prentice. 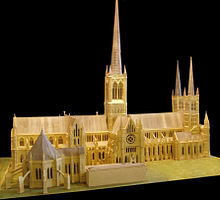 ^ "Timeline - Lincoln Cathedral". Retrieved 4 October 2018. ^ a b Kendrick, A. F. (1902). "2: The Central Tower". 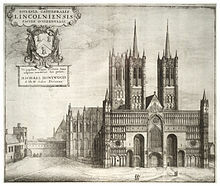 The Cathedral Church of Lincoln: A History and Description of its Fabric and a List of the Bishops. London: George Bell & Sons. p. 60. ISBN 978-1-178-03666-4. The tall spire of timber, covered with lead, which originally crowned this tower reached an altitude, it is said, of 525 feet; but this is doubtful. This spire was blown down during a tempest in January 1547-8. ^ Mary Jane Taber (1905), The cathedrals of England: an account of some of their distinguishing characteristics, p.100. ^ "Lincoln Cathedral — History". The Dean and Chapter of Lincoln Cathedral. Retrieved 13 November 2018. Between 1307 and 1311 the central tower was raised to its present height. Then around 1370 to 1400 the western towers were heightened. All three towers had spires until 1548 when the central tower's spire blew down. It had been the tallest building in the world. ^ "Floorplan - Lincoln Cathedral". Retrieved 4 October 2018. ^ The Penny magazine of the Society for the Diffusion of Useful Knowledge, Volumes 1–2, 1832, p. 132. ^ Essex, J., Some observations on Lincoln Cathedral. Read at the Society of Antiquaries, 16 March 1775, printed by W. Bowyer and J. Nichols, 1776. ^ a b Winkles, B., Winkles's Architectural and Picturesque Illustrations of the Cathedral Churches of England and Wales: Lincoln cathedral. Chichester cathedral. Ely cathedral. Peterborough cathedral. Norwich cathedral. Exeter cathedral. Bristol cathedral. Oxford cathedral, Wilson, 1838, p. 1. ^ Criddle, Peter (October 2008). "Lincolnshire and the Danes" (PDF). Lincolnshire Life. County Life Ltd: 16. Retrieved 10 April 2012. At Stow, Lincolnshire's mother-church before the building of Lincoln's Cathedral, the bishop was murdered and the church burnt down. ^ Kendrick, A F (1902) . "chapter 1 The History of the Building". The Cathedral Church of Lincoln: a history and description of its fabric and a list of the Bishops. London, United Kingdom: George Bell & Sons. p. 4. Retrieved 10 April 2012. The venerable church of St. Mary at Stow was called by Camden "the mother-church to Lincoln." ^ "Lincoln Cathedral". Smarthistory. 15 July 2017. Retrieved 20 July 2017. ^ Kendrick, A F (1902) . The Cathedral Church of Lincoln: a history and description of its fabric and a list of the Bishops. London, United Kingdom: George Bell & Sons. p. 20. Retrieved 10 April 2012. [Bishop Remigius] then gave directions for his funeral, and instructions that he was to be buried in the mother-church of his diocese dedicated to the Mother of God, near the altar of St. John the Baptist. ^ a b c Musson, R.M.W. (2008). The seismicity of the British Isles to 1600. BGS, Earth Hazards and Systems, Internal Report OR/08/049 (PDF). British Geological Survey. ^ van Liere, Frans (2003). "The study of canon law and the eclipse of the Lincoln schools, 1175–1225" (PDF). History of Universities. 18: 1–13. ISSN 0144-5138. Archived from the original (PDF) on 30 September 2011. ^ Hendrix, John Shannon (2011). Architecture as Cosmology: Lincoln Cathedral and English Gothic Architecture. New York: Peter Lang. p. 59. ISBN 1-433113-16-3. ^ "Dove Details". dove.cccbr.org.uk. Retrieved 5 May 2015. ^ Hendrix, John Shannon (2014). "The Architecture of Lincoln Cathedral and the Cosmologies of Bishop Grosseteste". In Temple, Nicholas; Hendrix, John Shannon; Frost, Christian (eds.). Bishop Robert Grosseteste and Lincoln Cathedral: Tracing Relationships between Medieval Concepts of Order and Built Form. Farnham, Surrey: Ashgate. ISBN 1-472412-75-3. ^ Haughton, Brian (2007), Hidden History: Lost Civilizations, Secret Knowledge, and Ancient Mysteries, p. 167. ^ Michael Woods, Mary B Woods (2009), Seven Wonders of the Ancient World, p. 41. ^ Darwin Porter, Danforth Prince (2010), Frommer's England 2010, p. 588. ^ a b "Magna Carta displayed at castle". BBC News Online. BBC. 18 July 2009. Retrieved 25 November 2009. ^ a b "Magna has no 'intrinsic value', 1941". National Archives UK. Flickr. Retrieved 22 August 2015. This Foreign Office document from 1941 proposes that Magna Carta be gifted to the USA during the Second World War. The document notes that Magna Carta holds no ‘intrinsic value’. The proposal was eventually rejected. ^ "Award for cathedral Magna Carta". BBC News Online. BBC. 4 August 2009. Retrieved 30 April 2010. ^ North, Thomas (1882). The Church Bells of the County and City of Lincoln. S. Clarke. p. 542. ^ Halpenny, Bruce (29 October 2009). "The Airfields of 'Bomber County'". BBC Lincolnshire. Retrieved 13 December 2011. ^ "RAF Waddington History". Royal Air Force. Retrieved 13 December 2011. ^ "'Bomber county' to get memorial". BBC News. 24 August 2006. Retrieved 13 December 2011. ^ a b "Planted Under Lincoln Cathedral". Singleton Argus (NSW : 1880–1954). NSW: National Library of Australia. 18 January 1943. p. 1. Retrieved 12 November 2013. ^ "Cathedral Times from Lincoln Cathedral". Lincoln Cathedral. Retrieved 30 October 2017. ^ "Visitor Attractions Trends in England 2010: Annual Report" (PDF). VisitEngland. 2011. p. 51. Retrieved 29 May 2012. ^ Ionescu, Daniel (17 August 2011). "Lincoln Cathedral visitor numbers plummet". The Lincolnite. Retrieved 29 May 2012. ^ "Planning your visit". Lincoln Cathedral. Retrieved 5 May 2015. ^ a b c d e "Lincolnshire's Da Vinci Code". BBC. 23 August 2008. Retrieved 30 December 2013. ^ "Da Vinci film arrives in Scotland". The Guardian. 27 September 2005. Retrieved 30 December 2013. ^ "Cathedral auctions Da Vinci props". BBC News. 29 January 2008. Retrieved 13 December 2011. ^ Bates, Stephen (28 August 2007). "People". The Guardian. Retrieved 13 December 2011. ^ "The King Netflix Movie filmed at Lincoln Cathedral". The LIncolnite. The Lincolnite. 25 June 2018. Retrieved 25 June 2018. ^ Buckler, John Chessell. "A description and defence of the restorations of the exterior of Lincoln Cathedral: with a comparative examination of the restorations of other cathedrals, parish churches,". HathiTrust Digital Library. HathiTrust. Retrieved 27 January 2017. ^ "New Lease of Life for Cathedral Quarry - Lincoln Cathedral". Lincoln Cathedral. 20 October 2016. Retrieved 25 January 2018. ^ a b "Stone 'running out' at cathedral quarry". BBC News. 4 May 2016. Retrieved 30 October 2017. ^ "Special Announcement from the Bishop of Lincoln: the new Dean of Lincoln". lincoln.anglican.org. Retrieved 25 October 2016. ^ Williams, Phil. "Appointment of new subdean". Lincoln Cathedral recent news. Lincoln: The Dean and Chapter of Lincoln Cathedral. Archived from the original on 19 January 2012. Retrieved 22 November 2011. John Patrick is well known in the Diocese of Lincoln, being Chair of the House of Clergy of the diocesan synod. He is currently Vicar of Sleaford and Rural Dean of the Deanery of Lafford. The subdean is responsible primarily for the fabric of the building and importantly for the pastoral care of all those in the cathedral community. ^ "Installation of Subdean and Canons". Lincoln Cathedral. Archived from the original on 11 April 2013. Retrieved 5 May 2015. ^ "New Canon Chancellor appointed at Lincoln Cathedral". 20 November 2017. Retrieved 4 October 2018. ^ "New Chancellor of Lincoln - Lincoln Cathedral". 19 November 2017. Retrieved 4 October 2018. ^ "The National Pipe Organ Register — NPOR". npor.org.uk. Retrieved 5 May 2015. ^ "The Organ of Lincoln Cathedral". lincolncathedral.com. 2013. Retrieved 15 April 2013. Wikimedia Commons has media related to Lincoln Cathedral.